Teleportel Europe N.V. | The Eye Contact Studio captures the video image of a presenter to appear with a professional quality typically only achieved in a broadcast television studio. 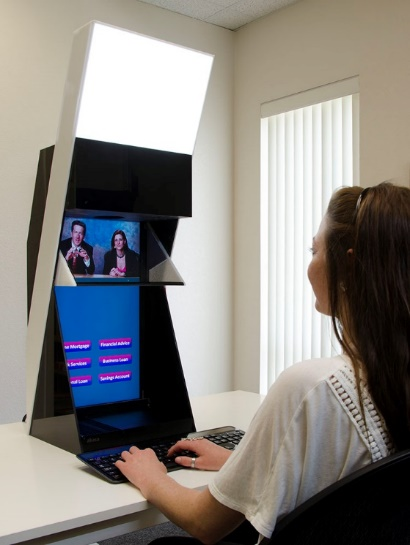 The Eye Contact Studio captures the video image of a presenter to appear with a professional quality typically only achieved in a broadcast television studio. The Eye Contact Studio assures that the presenter is captured on video by meeting the requirements of a professional television production studios. The quality of professional services are judged by what people see and the Eye Contact Studio delivers the optimal image. The agent can appear in 3D using Holographic Reality Display units, on 3D Kiosks, or on a desktop or mobile and always with genuine eye-contact. An LED light panel is held in position to provide soft lighting on the face of the presenter. This eliminates the shadows under the eyes that are a problem with typical room lighting.